A unique new astrophysics lab is on its way into orbit after a successful launch from Baikonur. 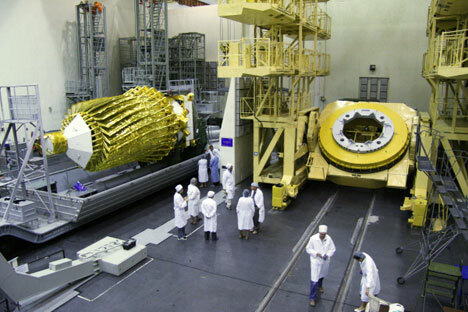 The Spektr-R observatory, called RadioAstron, has spent 30 years on the drawing board – but experts hope that its huge range will compensate for the delays in getting it into space. But what makes it such a big deal? While radio telescopes on Earth are limited by physics and the effect of gravity on their design and construction, shifting into orbit changes the rules of the game. The 10-meter antenna on RadioAstron is puny compared with its 100-meter counterparts downstairs, but one orbiting our planet at a distance almost as great as the moon's, it can join up with Earthbound monitors to create a massive virtual "dish" in the heavens. It's a process called interferometry, and was pioneered by the Japanese Space Agency in 1997 – but RadioAstron is the biggest yet. The net result, according to experts at The New Scientist is the equivalent of building a radio telescope 30 times bigger than the Earth itself. Moreover, image resolution is 10,000 times higher than that of the Hubble Space Telescope, previously regarded as the champion of deep space watching. So what can it actually see, and what might it be able to tell us? Scientists at the Russian Academy of Science's Institute of Space Research (ISR) intend to use it to study galactic nuclei, supermassive black holes, particle acceleration, magnetic fields and cosmic rays, RIA Novosti reported. If all that sounds like boys-own comic book stuff, the boffins contend that this delves into a better understanding of the very fabric of our universe. It could also have an immediate practical function: the end of 2012 is expected to see a surge in solar electro-magnetic activity – with potentially devastating knock-on effects for man-made satellites providing everything from severe weather warnings to live sports TV broadcasts. Lev Zelyony, head of the ISR hopes that the new telescope will play a role in monitoring this problem and curbing its worst effects. While there is justifiable excitement in the scientific community about this launch – which lends further weight to claims of a renaissance in Russian science – there is still one potential pitfall. First, the constant stream of data to be collected by RadioAstron is so vast – 144 megabits per second – that it must be constantly collected and collated back on Earth. And at present there is just one 22-meter antenna in Moscow Region is ready to receive, meaning that initially, at least, a good chunk of the information will be lost.